A school has become a "living breathing example of sustainability" by transforming an unused area into a cafe made from 100% recycled materials. The cafe at Castle Newnham, Bedford, was created using discarded items taken from around the school site. Designer Nikkita Palmer said: "I wanted to make something the pupils could learn from and love." Image caption One pupil said the school's eaterie made "you feel like you're in a cafe in town"
The money was raised by pupils at the state school, but the work was carried out by Ms Palmer. 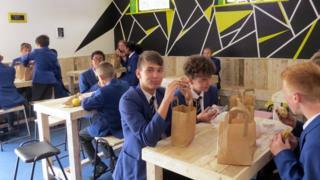 Ms Wilkes said: "This project really has become a living breathing example of sustainability for the pupils. "They are aware of the need to protect the environment and this is one way they have contributed to it." One Year 9 pupil said the cafe was "much more relaxed that a normal dining hall - you feel like you're in a cafe in town", while another in the year below said "it makes us realise what you can do with rubbish". Ms Palmer, 25, lives on a narrow boat in Northamptonshire and has her workshop in Stevington, just outside Bedford, with her partner Billy Barker, 35. "Being from a single parent family, we had very little money," she said. "I hated it then, but now I love it, as it taught me to take unwanted items, do them up and sell them to make money."